The following is part of an Organic Journey guest post series written by Amy, a long time helper behind the scenes of Southern Savers. 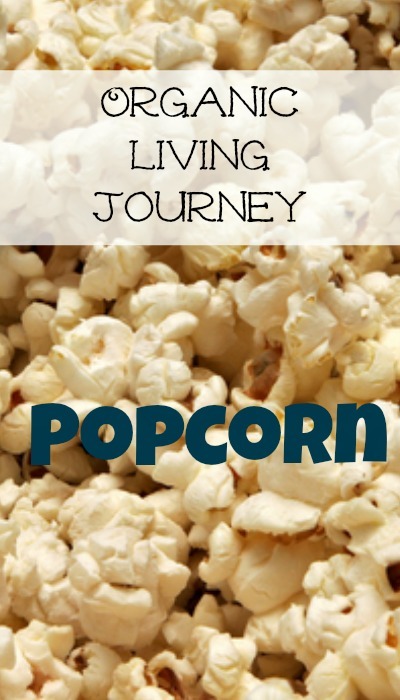 In attempts to feed my kids a healthier snack, I was giving them popcorn. Granted, it was microwave popcorn, but surely this was still better for them than goldfish or, heaven forbid, potato chips (one of my favorite snacks, not gonna lie). I was choosy with my brand. I bought the kind that said “Natural.” And the ingredient list is pretty simple: Popping corn, Palm Oil, Salt, Mixed Topocherols (for freshness). Okay, no idea what that last thing is. A quick Google search reveals that topocherols is vitamin E. So maybe my microwave popcorn isn’t all that evil. But that is just the natural popcorn! Check the label on yours just for kicks. Many have “artificial flavorings,” and we all know that isn’t typically real food. There is another new concern, though, that I have with my microwave popcorn–the whole GMO thing. I’m hearing more and more buzz about GMO (Genetically modified organisms) and, honestly, I don’t like what I’m hearing. My first thought about foods being modified was, “isn’t this kind of like hybrid tomatoes?” Further reading has proven that thought very wrong. It’s more like, “this kind of fish produces a natural antifreeze, of sorts. Let’s pull out that gene and put into tomatoes so that they will be more resistant to damage from frost.” So while that sounds creative and intriguing, it also just sounds weird to me. More reading raised my eyebrows further. GMO’s are often created so that the crops will be resistant to any kind of herbicide. Then the whole fields are sprayed with lots of herbicides to kill off weeds, and the genetically modified plants are unphased. That sounds like a bunch of chemicals on my food. Not so good. I am NOT an expert on GMO’s, and I’m not claiming to be. I’m sure that there are many parts of this argument that I don’t understand, but I do know this, what I’m reading makes me want to steer clear for now. And no, I’m not going to do that perfectly. From what I’m reading none of us are going to be able to do it perfectly because of cross-pollination, but I’d like to continue to learn more about all of this and avoid what I can. And why do I bring this up when we are talking about the yummy goodness of popcorn? Well, it appears that the bulk of our corn is genetically modified these days. Nice, hey? I was also curious what I was really paying for in those bags of popcorn. So, tonight, I cut one open. It was disgusting how much fat was in there (not that I should judge seeing as we love melted butter drizzled all over our popcorn in high quantities). Pretty gross stuff, but for the sake of all of our learning, I washed the fat off and measured the kernels. In one bag of microwave popcorn, there was 2.4 oz of kernels. Key information. File it away, we will come back to it. So, what’s a gal to do? If my cheap, yummy, microwave popcorn was out, I needed a solution for movie night at our house. I found it. I found organic popcorn kernels for less than $1/lb. Remember that there are 2.4 ounces of popcorn kernels in a typical bag of microwave popcorn? Math time! 16 oz (my pound of popcorn) = a little more than 6 bags (of 2.4 oz) microwave popcorn! That means for $1, I was getting the a little bit more popcorn than I could get in box of microwave popcorn that had six packs!! And it is organic! No pesticides, no GMO. Sounds good. Now, how to prepare it. Here are the three methods I know to make popcorn. You can make it on the stove. The only equipment needed is a pot and lid, stove, some high smoke point oil and your kernels. The other method is new to me, using a brown paper bag. Basically, you put kernels in a brown paper bag, fold it shut (roll it over 3-4 times) and then cook for 2-3 minutes. There are varying approaches to this, but that’s the basic method. One common complaint I read was that there are a lot of unpopped kernels with this method. The third method is what we do in my house. The air popper! I asked for this last year at Christmas, and we have LOVED it. I wanted to be cool and do the stovetop method, but let’s get honest, I had zero desire to clean up the pot each time we made popcorn. So, yeah, an air popper takes up space, but it is beyond worth it to me to be able to have a healthy snack for my kids with little to no clean-up required. You probably have one question left. Where did I find non-GMO, organic popcorn kernels for less than $1/lb? Networking has proven to be such a huge help to me in the journey. I have a friend who was traveling up north this summer to visit family and was picking up some bulk grain purchases. She grabbed a 50 lb bag of popcorn for me, and then I split that with a friend. Shipping cost was nothing. Nice, hey? Yes, that is still a TON of popcorn, but stored in my bucket with a gamma lid, it should last a really long time! Someone else commented that this site can help you locate a bulk food seller near you. My baby step-making the switch to organic popcorn kernels. It doesn’t cost that much more time or effort. Yay for easy baby steps!! So if you love popcorn, what ways have you found to get a good deal on it and to keep it healthy?